Session: Who’s Writing Your Story? Recap: As PR professionals, we are storytellers. In this session, Co-Founder of Nebo Agency Brian Easter focused on how as public relations professionals we are not only storytellers in our professional lives but also storytellers in our personal lives. Easter told the audience that the top regret of retirees is that they lived their life on other people’s terms– not their own. We are the writers of our own story so it is up to us to make it interesting. How do you write a story that you can be proud of? Easter explained it to the audience in a series of steps. First, you must set goals for your life. With these goals, it is crucial to know that success is a process and that once specific goals are met, you must set new goals. To write a successful story, you have to realize mistakes when you make them, overcome obstacles in life and overcome your fears. You must also be passionate about what you do and always keep a balance. If we are the storytellers of our own lives, we might as well make it a good one! In your own story, you can’t be the protagonist without other characters. To tell a great story, you have to break the rules but you must break the rules for the right reasons. To be the best you can be, your life must have balance. Emily Blackwood is a senior mass communications and marketing student at Georgia College and State University. 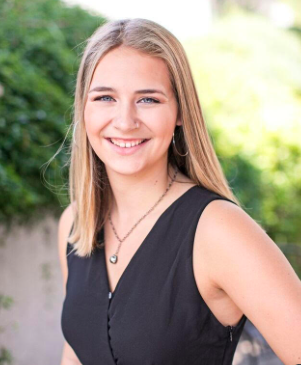 She is the president for her Chapter of PRSSA and is a social media intern for the Atlanta-based restaurant group Castellucci Hospitality Group. Follow her on Instagram @emilyeblackwoodor LinkedIn.